Christy Stewart-Smith reflects on the perils of research. Having worked in marketing and advertising for more that (ahem!) twenty years, it’s rather extraordinary that I only have one real regret. And it was from the early days, working on Persil at J. Walter Thompson in 1996. They were after a “new news” vehicle. This is ad-speak for a campaign structure in which all sorts of splendid new features and formulations can be showcased to increase the perceived dynamism and efficacy of the brand. He was called WA5H (of course). 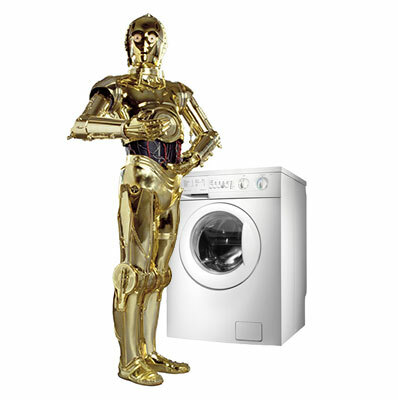 In the campaign C3PO was his usual panicky, disgruntled self, but constantly beset with washing and laundry problems. WA5H had a irresponsible, mischievous character – rather like R2D2. But, also – of course – had the appropriate Persil-based solution to all his companion’s detergent dilemmas. It was a classic “Brand Novice + Brand Expert” construction. Tom Darby and Lucy Figgis got in touch with LucasFilm, the owners of the rights to all the Star Wars characters. And Lucas offered us UK advertising rights to C3P0 for £100,000. We tested seven or eight animatics (proto-ads) in focus groups around the country with 35-50 year old Mums (Persil’s so called “heavy users”). They got all the product messages. They enjoyed the ads and they laughed at the jokes. And they loved the WA5H character. But then they told us Star Wars seemed a bit old-fashioned and wondered whether we should be using something a bit more up to date. So Levers shelved the idea. “New News” campaigns have to be “new”, right? This is despite the fact that “Episode One – The Phantom Menace” the new Star Wars film was already in production and everyone knew that two sequels had already been written. So by all means test your campaigns with customers, use research to gauge their reactions to the things you’re proposing. But for God’s sake don’t ask them for their advice. Or take it when it’s offered.